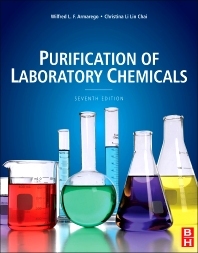 A best seller since 1966, Purification of Laboratory Chemicals keeps engineers, scientists, chemists, biochemists and students up to date with the purification of the chemical reagents with which they work, the processes for their purification, and guides readers on critical safety and hazards for the safe handling of chemicals and processes. The Seventh Edition is fully updated and provides expanded coverage of the latest commercially available chemical products and processing techniques, safety and hazards: over 200 pages of coverage of new commercially available chemicals since the previous edition. Wilfred L. F. Armarego graduated BSc (Hons) in 1953 and PhD from the University of London in 1956 and came to Australia in that year. After two years at the Central Research Laboratories (ICIANZ) in Melbourne, where he worked on plant growth substances, and one year on potentially carcinogenic polycyclic aromatic hydrocarbons at the University of Melbourne as Senior Demonstrator in Organic Chemistry, he joined the Department of Medical Chemistry as a Research Fellow in 1960. He became a Fellow in 1963 and was awarded a DSc degree (London) in 1968. He was promoted to Senior Fellow in 1967 and began research work on the biochemistry and molecular biology of pteridine-requiring enzymes related to the inherited metabolic disease phenylketonuria and its variants. He was head of the Protein Biochemistry Group and Pteridine Biochemistry Laboratory until his retirement in 1996. He is now a visiting fellow at the John Curtin School of Medical Research, and member of the editorial boards of ‘Medicinal Research Reviews’ and ‘Pteridines’ journals.